Lumbini Park has a certain nostalgia attached to it. Known for its boat rides, musical fountains and laser show — this park has made every city kid's childhood awesome. Located near the Hussain Sagar Lake, Lumbini Park might have been many a child's favourite park in the city (We know, it was ours!). 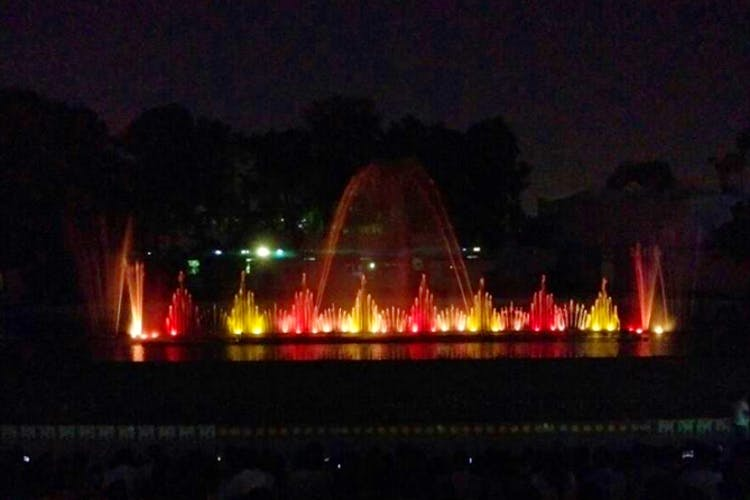 Thanks to the sprawling lawns, flowing plants, candy floss and the marvellous musical fountains followed by a laser show that continues to fascinate to this day. So, we think it's time to revisit this place and breathe in the nostalgia while you witness the beauty of the laser beams conjuring cityscapes, and 3D monuments out of thin air. The neon colours of the laser are awe-inspiring and narrate the history of Hyderabad, captivating your attention, in a way Facebook and Youtube never can. So, unwind here one fine evening as the show happens at 7.15pm every day, and twice on the weekends (Second show at 8.30pm). You can enjoy it for a mere INR 50 per person, in addition to the entry fee of INR 10. Although, the laser show is a great attraction, we believe that it's time to upgrade the technology as the lights are not always bright enough, and neither is the seating comfortable. But, go anyway and relive some childhood memories, and take your little ones too.